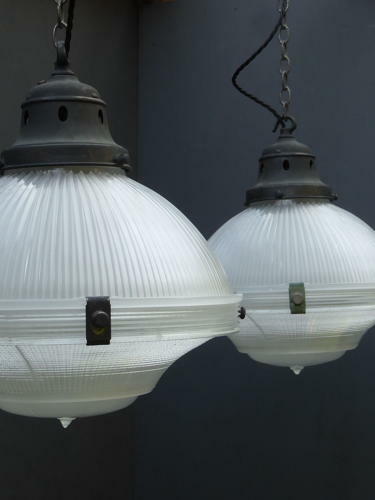 A large pair of antique Holophane glass pendant lights. Wonderful three part prismatic glass pendant lights with their original copper galleries & often-absent lower inserts. Not often found in this larger size & magnificent once lit. Priced per light with two available. Wear commensurate with age, in good condition with a few very minor nibbles to the ribbing, one light has a small chip to the tip of the lower insert & both have a couple of chips to the inner edge of the lower rims (worst pictured close up, all completely hidden from view when the lights are assembled) & nothing which detracts. UK shipping available at £15 per light, tracked & signed for 24 hour delivery.